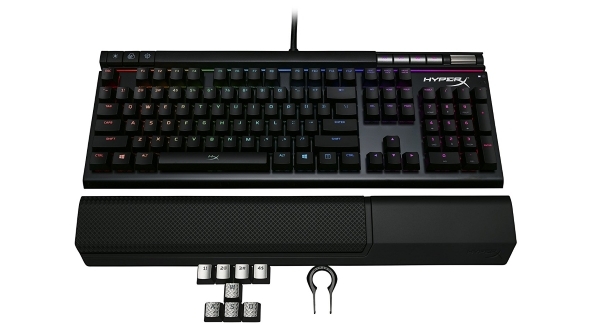 The original HyperX Alloy keyboard was a long time coming, but since that simple, solid, and slimline gaming keyboard first dropped HyperX have gone all out on their top-spec model, the Alloy Elite RGB. And it’s quite something. Check out our pick of the best gaming keyboards around today. It was a surprise the company had taken so long to get into the wider peripherals market having made such a splash with their HyperX Cloud headset, and the subsequent, brilliant HyperX Cloud Alpha. But when they dropped the Alloy it was clear they’d been waiting until they got it right. And get it right they did. 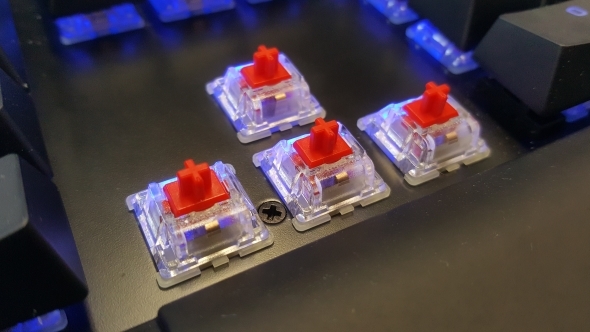 The solid metal base of the Alloy allowed the Cherry MX keys to float above it, glowing red under their keycaps. It was simple and understated, without the over-designed angles of some of its gaming-focused brethren. 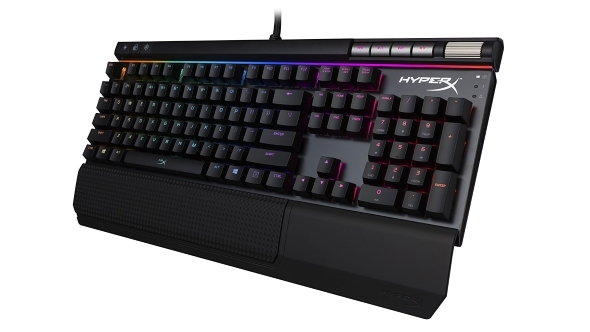 It’s clear that the $170 / £150HyperX Alloy Elite RGB shares the same DNA with its forbear – there’s the same robust base, the Cherry MX support, and therefore ultra-responsive gaming performance. But the Alloy Elite RGB also rights the few wrongs that needed ironing out from HyperX’s original design. The most obvious thing is the addition of a wrist rest – that’s a welcome feature for those long gaming sessions, giving your RSI’d joints a little relief. It’s nowhere near as lovely as the padded rest from the Razer Blackwidow boards, but it solid and securely attached to the board. They’ve also given us proper discrete media controls this time, including a free-wheeling volume wheel, a la Corsair’s mighty K70 design. In an almost identical arrangement to the Corsair board, the illuminated pause, skip, and mute buttons are set around the volume wheel, though alongside it rather than below. On the far left-hand side of the board are the discrete lighting and gaming mode controls – there’s no Fn key digital gymnastics required here. One button controls the brightness – in three levels of luminance as well as completely off – while the middle one cycles, as default, between the RGB wave effect, FPS blue tone (with highlighted WSAD), and an all-red Flame profile which pulses as you type. And I’m actually finding that quite distracting as I type this, because I just want to see what it’s doing. You can change all this in HyperX’s NGenuity software to add in custom lighting profiles to the onboard rotation. Also in the NGenuity software is the ability to add in game-specific lighting profiles – there are a host already in the Windows app, from Fallout 4, to Destiny 2, to Kerbal Space Program, and you can further customise them to your heart’s content. The final gaming mode button disables the Win keys so you don’t end up accidentally dragging yourself out of a game with an errant strike. The classic Cherry MX Red RGB switches deliver the performance, and livid lighting, that you’d expect from the biggest name in mechanical keyboard tech. They’re responsive and linear, with none of the gritty, clicky-ness of the Blue or Brown switches. Though if you’re a fool for horribly tactile switches – like our Jacob – then you can pick up the Alloy Elite RGB in either flavour should you wish. I’m a big fan of this latest HyperX board. It’s not exactly doing anything revolutionary, but that’s because they’ve looked at the best in the market and made sure the Alloy Elite RGB is up there with the top boards around. The build quality is excellent, and it feels solid and like it will just last and last. I’m also very happy they’ve gone for the discrete key setup, but the plastic base for the lighting and game mode buttons feels a little bit at odds with the beautifully machined metal of the main keyboard’s base. I’d also like the padded rest that Razer have added and that Logitech look set to add to their range, but that’s just me being a pampered pillock. The only real hesitation I have in recommending the Alloy Elite RGB is the price. At $170 / £150 it’s added an unfeasibly huge RGB premium to the design over the otherwise identically excellent, one-colour Alloy Elite boards. You’re looking at spending $70 / £50 extra just to have the option to change the colours. And you’d have to really hate the red aesthetic to want to spend that much extra on this RGB version, which makes it tough to recommend over its impressive sibling.